Breading is a good way to begin getting to know eggplant, since the breadcrumb coating adds familiar flavor and a nice texture. 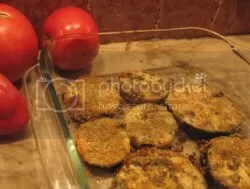 Those who are experienced eggplant eaters will also like the possibilities presented by a nice breaded eggplant fillet. Layer, roll or top with different sauces, cheeses and nuts for some fast but interesting meals. 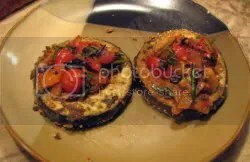 In this recipe, the eggplant is topped with a fresh tomato mixture that is just barely cooked, so it remains very fresh tasting. 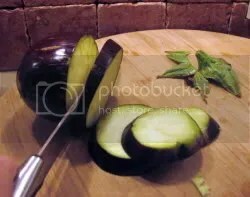 In terms of timing, it can be helpful to prepare the topping ingredients first, but wait to cook them until the eggplant is baking so they don’t get overcooked. Step 4: Bread the Eggplant Lightly oil a cookie sheet with olive oil. 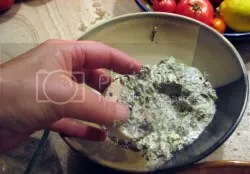 Using your hands, slather each eggplant slice with the mayonnaise wash, then lay each side in crumbs, lightly patting crumbs so they stick into the wash. Lay on oiled cookie sheet. Step 5: Bake Place cookie sheet in oven and bake eggplant about 5-10 minutes, until slices are lightly browned and tender when stuck with a fork. Remove slices to a serving platter. While eggplant bakes, prepare Tomato Topping. Mary Hi and happy fall! Bev Gay from the Monroe farms cooking class. My bottle of Canola oil is almost empty and we had a discussion of oils pros and cons. What did you suggest we purchase instead of Canola oil?I have a good Olive oil already but I don’t use it for everything. I need a choice that will take the temperature of wok cooking Many thanks! Great to hear from you Bev. Besides olive oil, which I use for the bulk of my dishes, I’ve been gravitating to sunflower and safflower oils. Both are neutral-flavored, so good for dishes where I don’t want olive oil’s flavor, e.g., Indian, Thai and Chinese dishes. Both also have high smoke points so they can double as stir-fry oils, and they are reasonably priced.